Phase 3 of District 9 just hit our Tiny Quahogs! 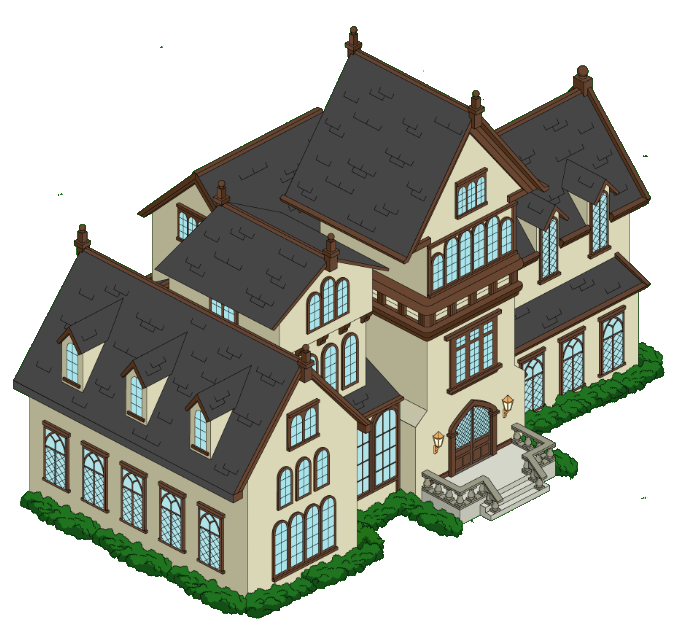 More details as we go through it all ourselves…but for now know that things get started with Stewie and you’ll be asked to build the Mayor’s Mansion (It’ll set you back $10,000 and take 24hrs to build)…and yes this will FINALLY unlock Mayor West! Also, know that you have to have completed Who Let the Dogs Out Pt. 8 before this will trigger in your game. Note: This will NOT unlock until you have Mayor West and are prompted to build it via his questline (Mayor West Runs the Town Pt. 4). 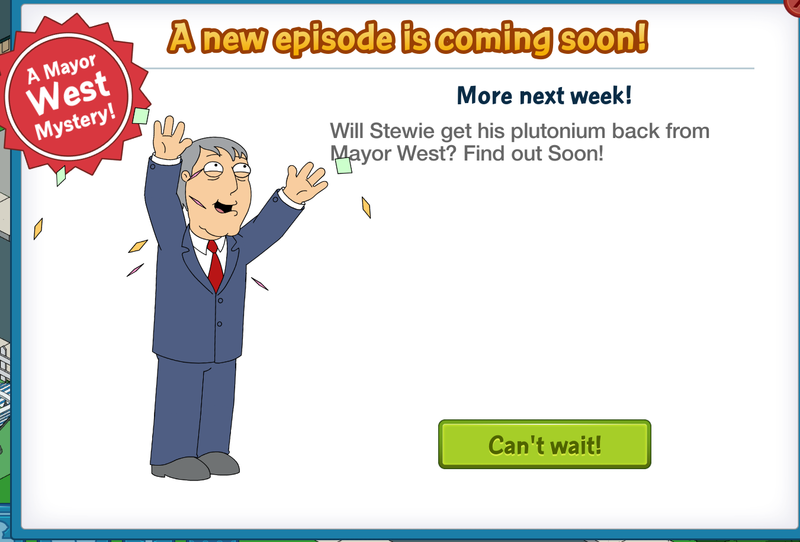 UPDATE BUNNY 12:15AM EST: I did NOT tap Stewie to start the dialog for the new Adam West stuff. 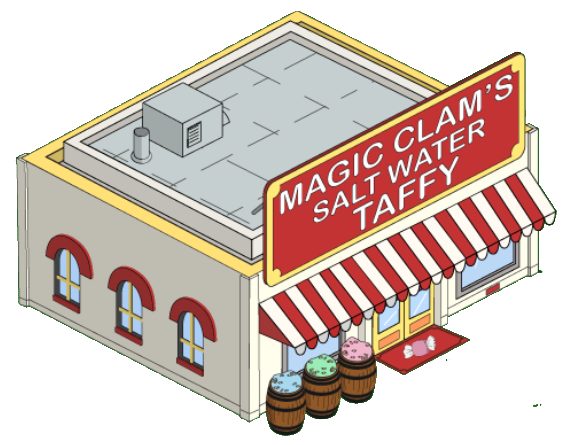 I was able to buy and place Magic Clams. So if you already have triggered it, you may have to wait til Pt 4. If you did not, you might be able to snag it now. You’ll also see a popup in your store for the Factory for $7,500 (this can be placed as . Instant Build. This Triggers the ability to make Cologne. Each one of these earns ONE Cologne Bottle. You’ll have to repeat the process of collecting bottles etc several times to create enough Cologne Bottles to help Mayor West. What do YOU think of the additions? 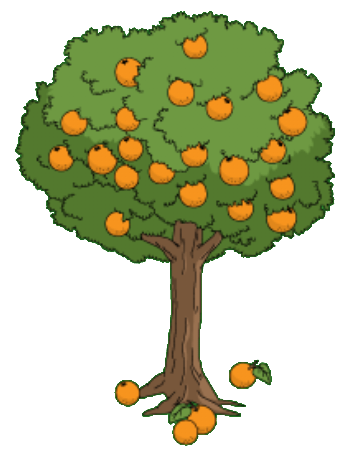 Do you like the number of decorations (FREE decorations) included with this update? 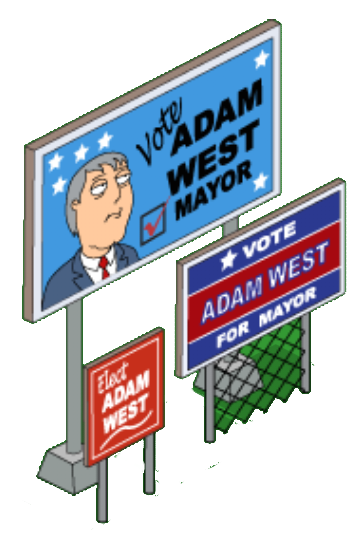 Thoughts on Mayor West joining the game? Was he worth the wait? Sound off in the comments below, you know we LOVE hearing from you! 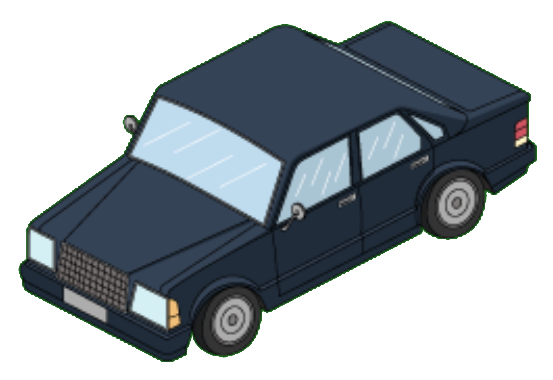 This entry was posted in Buildings, Characters, District 9, Tips and Tricks, Updates and tagged Family Guy Addicts, Family Guy Game, Family Guy The Quest For Stuff, Family Guy Tips and Tricks, How Do I Unlock Mayor West, Where's Mayor West?. Bookmark the permalink. 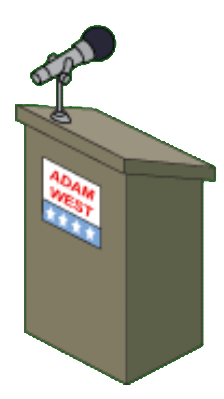 I’m having a little trouble finding Mayor dam West. I’ve unlocked district 9, as well as Stewie, and am now in the process of getting Tom Tucker. 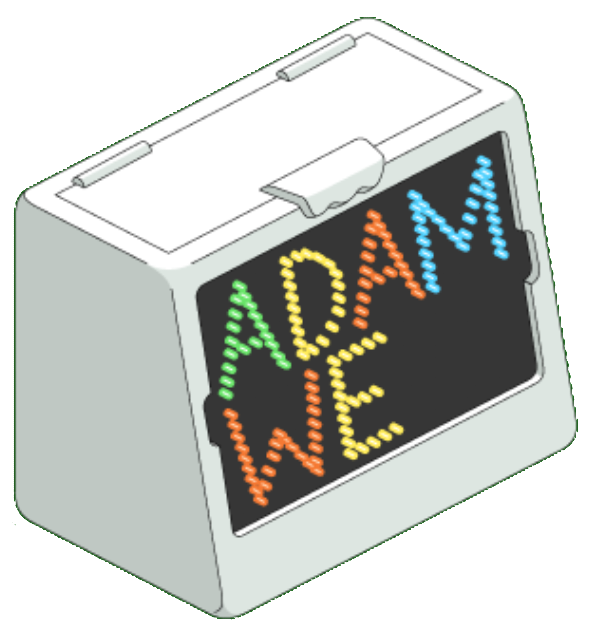 But whenever i look hrough the store for Adam West his mansion isnt anywhere. Does he come after I unlock Tom? 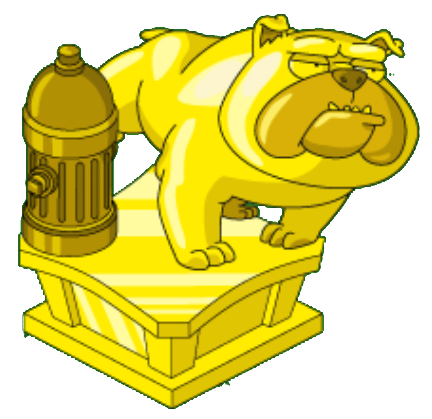 I am doing the Mayor West quest line (he is not unlocked yet) and I am collecting the empty perfume bottles, I have noticed that once I have filled the need amount for certain bottles types they are still available to collect so I have 20+ of certain types, my question is, Do they have a purpose other then just for making Mayor West’s gift baskets? Will all of the excess ones I have go towards filling the requirement of another quest later down the line? On a side note,, is there a way that I can check a box or something so that I get an email when my specific question is answered? But those send me an email anytime anyone leaves a comment about anything on any post, so is there a way to get an email alert when this question I am writing you now gets responded to only? Thanks again for all the Awesome work you and Alissa do, you make this game so much better. Sorry. This site is hosted by WordPress and those really are the only options. As far as bottles… you will need to create several. So they still collect until you are done with them all. Dear Bunny, OK, almost all of my characters (except the new ones) are maxxed out, Mayor West has nothing left to do, and we still have no word about the Plutonium. Any advance word about when the Plutonium will show up? Thanks in advance. Anyone else having trouble finding West’s cowboy statue? Just unlocked that level for him and can’t find that statue anywhere… Looked in Decos twice! Yes i did I check inventory all the time just in case …. Weird, huh? I have completed all of these tasks and now there is nothing for me to do, but i didnt get the plutonium for stewie, have i done somethimg wrong or is there still more to come??? The final round of Plutonium is not yet in the game…it’s a cliffhanger left for us to ponder during Halloween. Known issue. Let us know if it has been fixed though. Found out the answer,just by reading. Can you tell me if this is a glitch or it’s okay? When I finished making the bottles for Mayor West,my building vanished?I thought it might have went into inventory but no GonE! After I finished creating all of my cologne bottle, my fragrance factory disappeared. Is this normal? I think my quest continued to the next step. Do I still need the factory or is it okay that it’s gone? Yes ,I got all perfumes then the game kicks me off of game.i need to restart again. I then lose perfumes bottles. Contact TinyCo via the game to let them know you’re impacted by the crashing as well. They are working on a fix, but it helps them to know who’s still impacted. Known issue. All you can do is wait while they find a fix. Sorry. You are welcome to contact them too via your game to let them know you are one of the ones impacted. The game crashes every time I try to go into the fragrance factory. . I dont know if my bottles etc collected are being recorded. Is this happening to anyone else? There is a timer clock on my mayor west quest, is thus timed? OK, really confused. I needed a few more jugs to complete the Kool Aid guy but now when i clock on Jerome the jug icon doesnt appear under 1 hour baseball category. Same also goes for Chris’s hula hoop etc. When I clock on the Kool Aid Icon in the side bar and then click Go the next window doesnt pop up. I updated my ios today, has this affected it? Hi gals, I just hot access to wild wild mayor west part 4. In my game I was able to place the cologne factory in tandem with stewie 24 hour task. 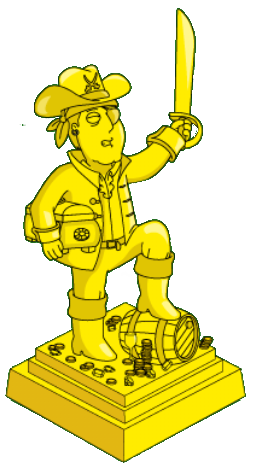 Do you currently have Brian unlocked in your Quahog? Soooo.. I unlocked koolaid man this morning.. Do you know where he is??? I can’t find out where he is.. He’s not in inventory or my town or my store or at Al’s.. Please help me bunny or Alissa!! He should be in your inventory (remember not the store…your inventory can be accessed through the move menu). If he’s not there then next step is to contact TinyCo.. 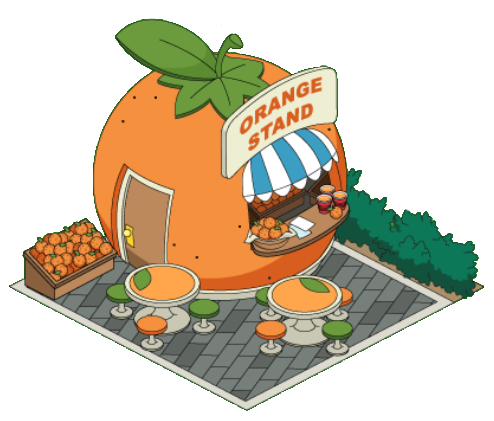 So maybe it’s because Mayor West is crazy, but how is it that Brian fact-checking on the internet gets oranges, but the Cute Li’l Orange Stand doesn’t, and Jerome growing his ‘fro gets kittens, but Bruce kitten picking doesn’t?! Strange world this Tiny Quahog is…isn’t it? Stewie: Hey, arent you the Kool-Aid guy? KA: Just waitin dude, Relax! Brian: Hey do you know where we can buy some batteries? KA: Not now guys leave me alone, I need to be up. Did you get to that part of the questline? It should be in the featured tab of the store. Has anyone else have more than one plutonium? And if yes where are u getting them from. I’ve only had one since the beginning of district 9. The blimp is still sitting in the water. It says we have to collect them from quest in district 9. You can see all the ways to unlock it here.. I have meg and she isn’t offering or dropping anymore plutonium. Either is anyone else. If your Blimp is built and still broken and shooting out electricity once in a while, then you’re right where you need to be. District 9 comes in stages. The next Blimp stage has not hit yet. Focus on Vinny, Tom, Mayor West and other items til then. What do we know about the cologne factory? 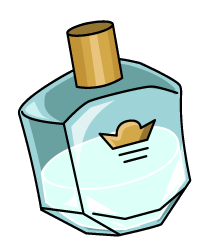 When one bottle is made, does the counter for fragrances reset or can we keep collecting? I got a quest to unlock vinnie in 2 days. Did I miss a post on that? So, reading through the comments and there is mention of the blimp hanger and the fragrance factory dissapearing after their tasks are complete. Is this correct? 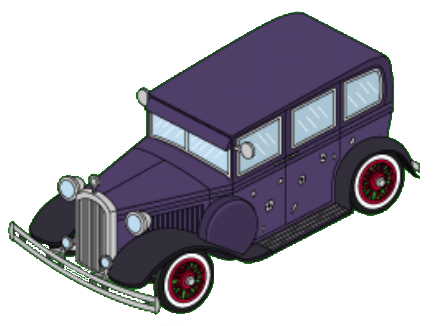 I still have my hanger and have started on Mayor west and built the factory and have started making the colognes . 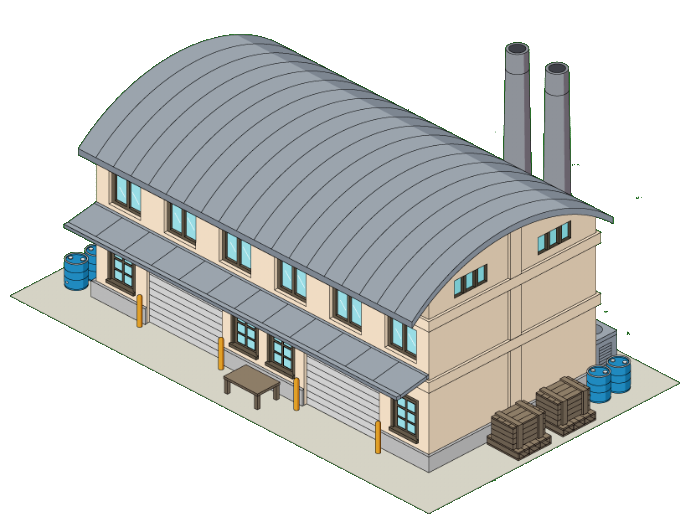 I personally want to keep both buildings as they fit into my “industrial” are of my quohog. Also since we payed with coins we should be allowed to keep. Soooo excited to have kool aid man tmrw!! Got my alarms set for 4am lmao to get my last ice cubes! Can’t wait to get started on the quest line !!! Man, this blog has taken a turn for the worst. I apologize to the Addicts for the crap they have to deal with. This used to be a place of discussion, conversations and comments. Now everybody just wants to complain, insult and lash out over a game. As popularity rises, the amount of people who are frantically searching Google for answers are finding themselves here. Nobody wants to read posts, or other comments. It’s pure selfishness and impatience to just type YOUR ‘comment’ and ignore the rest of this beautiful site. Yet, the Addicts keep on pumping away, dealing with you headaches. If I were you, I would cut the crap and post a main page disclaimer. I understand you guys (gals now) want to allow everyone to express their opinions, but it’s getting very out of hand. I’m terrified these entitled jokers will burn you out and the site will rot. The amount of work you guys do is always appreciated by the true fans; the fans who actually read the site. It’s a fair assumption that while you waste your time answering the same hostile question for the ump-teenth time, the posters you are wasting your time on aren’t returning the favor towards YOUR work. Keep up the good work Addicts, and again, I’m really sorry for the nightmare that has become the comments section. I read the comment about pkaying every 1-2 hours and should be able to do timed events, even when working. Odd that because my boss would not be happy at all if every hour or so I stopped to play a game, I would go hungry and would be looking for another job, thats why often players cannot complete timed events. On the good side just got mayor West mansion, and looking foreward to getting him in the normal way. Also people need to realize that you do not have to play this game at all or if you chose to, you do not need to complete every single challenge. I feel some here are a bit obsessive with this game, you need to balance your life and go out and enjoy your day. Also, this is a completely free game, you may pay for advantages features and premium content, but in the end it is free and I think TinyCo is doing an awesome job as such. Enjoy it, if it becomes so obsessive then put it down, it is just a silly (SUPER FUN!!!) game, approach it as such. I check as often as I can. But I’m far from obsessed and have a full and balanced life. The game takes very small amounts of time spread out over the day. On a day off I will set timers for tasks, and spend the 30-60 seconds every hour or two needed to clear them. Its less abouy obsession than freedom. I can grt away with checking my game 4-5 times during the work day without causeing any problem and usually while I am doing something else that required me to wait. That doesn’t make me crazy, haha. Whoever posted that comment probably has a laid back job then. Because nurses like me have no time to check every one or two hours. Hey i started this quest .. stewie is still drawing the factory but i placed the factory down already… but everytime i click on the fragrance factory my game crashes do i have to wait till stewie is done with his task? You can see if that helps. A few others are reporting the same thing happening to them…if it continues (and try a hard close..ie shut down the app…as well) then contact TinyCo on it. What do you mean by shut the app down? Like delete it then re-install it? In the meantime, some have found skipping the factory and instead tapping on the task bar link for the cologne collection there instead, and using go helped to open the cologne screen. Heads up on pink Brian. You continue to get the same candy when you fill one up. I thought I would have him today but no. I now have 3/3 4/3 and 3/4. Yup…everyone’s seeing the same thing today. Hard hard closing (ie shut down the app) and restarting. If it doesnt work next step is to contact TinyCo.